We love our dogs so much and want them to feel special on Halloween too. While they will not be indulging in candy like my daughter will, they still can have some fun treats for the holiday. I made this Halloween treat BOO basket for the dogs to enjoy. They love it of course! We are constantly working on the relationship between the dogs and Adalyn. One dog is scared of Adalyn and shakes when she pets him. The other dog is mean and growls at Adalyn when she pets her (obviously not good). One of the things that seems to work is when Adalyn gives them treats. Then, they will actually come up to her and will act nice. Maybe not the best solution in the world but it is what is working for us right now. Since I am a little crazy with the dogs, I have to dress them up for Halloween of course! They have had a few costumes through the years and each year, I enjoy choosing what they are going to wear. I stuck their costumes in their basket as well. They have to dress up to get their treats, right?!? The dogs will not be trick-or-treating because they bark way too much at people but we will have our own little celebration at home. Adalyn will be giving them their treats of course! I bought Jaxen's lion hat from Walmart for only $1.97!! Ava is a mermaid. For the water bowl, I decorated it with Halloween stickers and then turned it over in the basket to give the treats height. It is a good way to fill a basket and show all of the ingredients. My dogs are also getting a couple of Halloween toys which they love. I bought these different treats from Walmart. One of the treats that I included are the PEDIGREE® DENTASTIX™ which I have been giving to the dogs for years (they have terrible breath!). The other treats that I picked up were the PEDIGREE® MARROBONE™ treats and the CESAR® SAVORY DELIGHTS® ROTISSERIE CHICKEN FLAVOR WITH BACON and CHEESE. The dogs are in heaven! Walmart also has some fun products from American Greetings® that are great for kids, pets or adults. 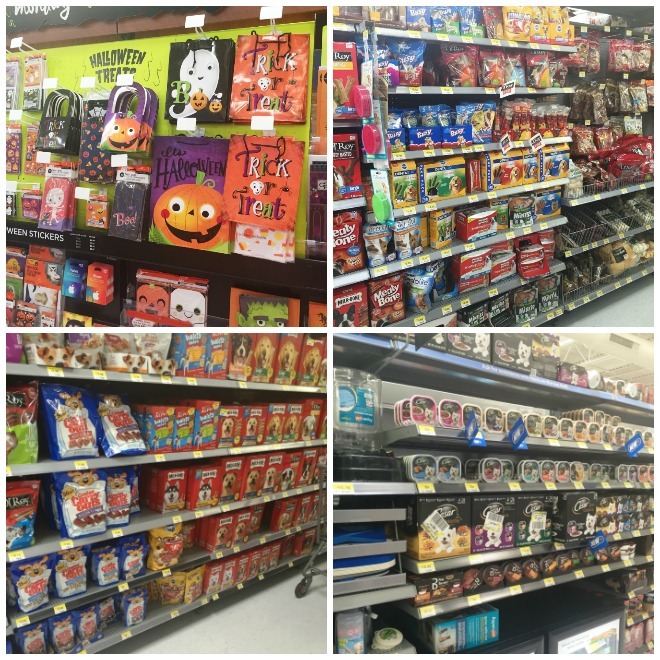 They have some fun Halloween stickers, treat bags, tissue paper, cards and more. I love the little stickers that I picked up from Walmart for Halloween! For more information about creating a BOO basket for your pets, check out this site. To BOO a pet you know, make a BOO bundle, secretly deliver it and then BOO it forward! Ha! You're dogs are super adorable. How perfect is that lion's mane? #client.